Roses are one of the most beautiful flowers. However, they are also one of the most difficult to draw because of its complex design. Nevertheless, being able to draw them is considered to be quite an achievement. 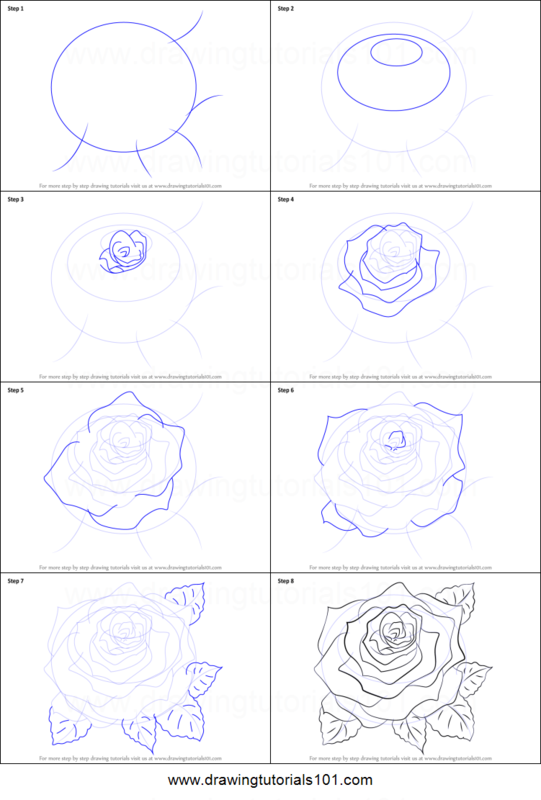 So, here are the basics if you want to learn to draw a rose. You would need: soft pastels, Conte crayon or charcoal; drawing paper; knead eraser; dry towel and damp washcloth for cleaning hands; and cotton swab to be used for blending. It is possible for you to draw it in yellow or red with green leaves. You can also make it fancy such as pink and orange, or go whimsical and make a blue rose and purple leaves. It all depends on your taste. Nevertheless, it is important that your lines are strong and you have got the correct shading for your picture to look good whatever color you use. Sketch a swirl. Place this swirl approximately where you want the center of your rose to be. Your swirl should look like an unclosed circle that has an excess on the end. Try to make it curvy and elliptical in shape. Draw this lightly first using your chosen drawing material. Add some petals around its center. Try to keep the lines short where they would be going down to meet the succeeding row of petals. Petals generally involve C shaped and inverted-C shaped lines. C shaped for the left side of the rose and inverted for the right side of the rose. Try drawing the petal lines lightly first. After you have drawn the lines, that is the time you would shade. You are going to shade by smudging off the lines. Be careful when smudging, so that you won’t tear or create a hole on your paper. After smudging, strengthen back the lines. Try to make them strong and dark. Clean up your drawing by carefully blowing loose dust on it. Be careful that you do not to touch the dark areas. If you do, it would get smudged again. If ever an accident like this happens, squish your kneaded eraser a couple of times. After which, use it to carefully remove the unwanted smudges. To avoid further damage, it would be better if you press and lift rather than rub like how you would do using a normal eraser. Nevertheless, if the smudge is not right beside a line, you could just rub gently. Each time your knead eraser gets dirty; simply fold it so that the dirty part would be placed inside. Simply stretch and fold for a number of times. For sure you can get a clean surface in no time. As a guide you can use a book or a picture of a painting that has roses in it. Familiarize yourself with the rose structure. Observe the petal shapes. Usually, there’s a dip midline of a petal. Sometimes a part of it also turns over out. Add these kind of details to your drawing and you’ll have a rose in no time! group Art Studio of Lewis Baber , Post and Sell your ART.